For Leona McGillis Kensley it’s a labour of love. Since the Dew Drop closed residents in the area have lost a source for eats. 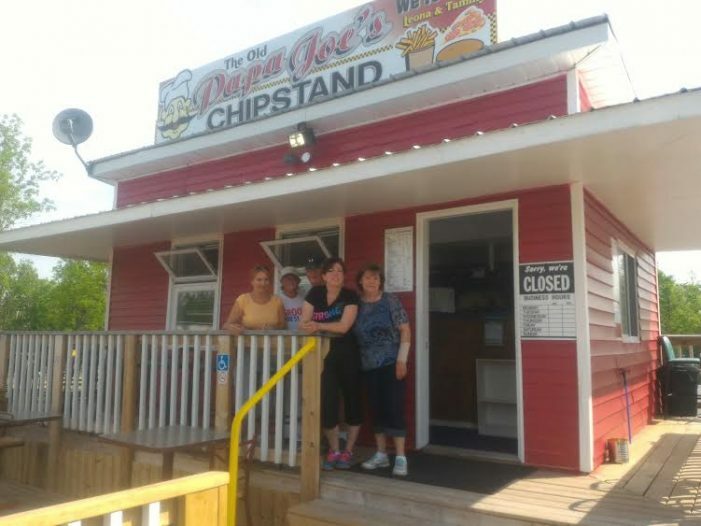 She’s teamed up with some friends and family, and along with a near brand new spanking kitchen has opened up the Ol Papa Joe’s Chip Stand which is at the four corners in Bonville on busy Highway 138 across from the Habitat for Humanity ReStore. The menu offers up traditional chip stand fare. I hope it makes it. That corner of the 138 has not been kind lately to businesses. First there was a previous chip stand there. Then I think it was a dune buggy track. Now a chip stand is back, with a mini-golf course. Good luck. Hugger the silly owner of the mini golf boycotts CFN. It’s kinda funny. There used to be a flee market there some years ago which was good and after that I saw a habitat for low income houses and I haven’t been down to Cornwall in over a year now. I don’t know what is there but anybody who boycott’s CFN will not get my business and I stuck to that right up till today Jamie. I don’t care how good Farm Boy is or not I stuck to my word. Congrats to Leona for taking on this adventure, if the food is anything like that of the Dew Drop Inn, word of mouth & advertising will have people wanting to try it. I once lived in that area & I never even heard of Papa Joe,s .